Good morning polished world! How are you all doing today? I am so sorry I haven't posted more this week, but honestly this week really got away from me. Before I knew it, Friday was here, then Saturday was over, and I just don't know where the time went. Looking back at my week though, it's so unbelievable the stuff that has occured. Seriously thinking about selling my life rights to Lifetime for a movie. It would be quite a movie. Today's nail design was supposed to be posted on Friday when it was 92 degrees. Now it's back down into the 60s where it should be for this time of year. 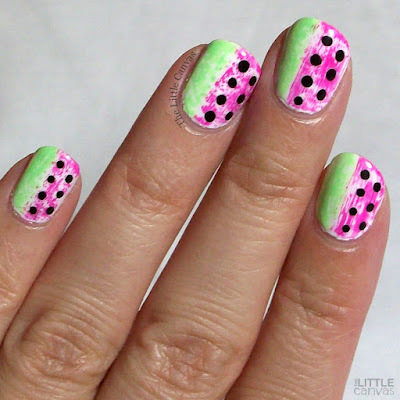 It is a re-creation of a dry brush watermelon manicure I did a few years ago. I actually wore this design in August for the family picnic at work, then just never got around to posting it. Such is life lately, right? Cool right? 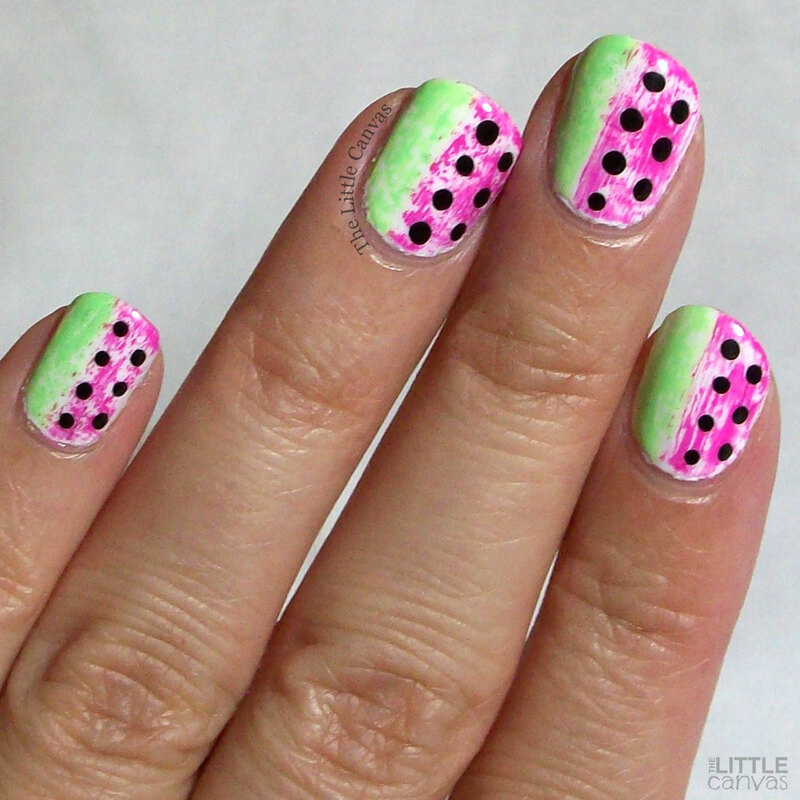 A little abstract watermelon design. I don't remember if I was originally inspired by someone else for this design or just came up with it on my own. To be honest, I don't think I'm this creative....maybe I was. I should probably scroll back through and check, but that involves effort and currently as I type this post, I'm watching blondies baking in the oven and sauce cooking on the stove. Queen of multi-tasking at this moment. It's a super easy design to do. First, start off with a base of white. When that's dried, take your green polish and dry brush 1/3 of your nail. 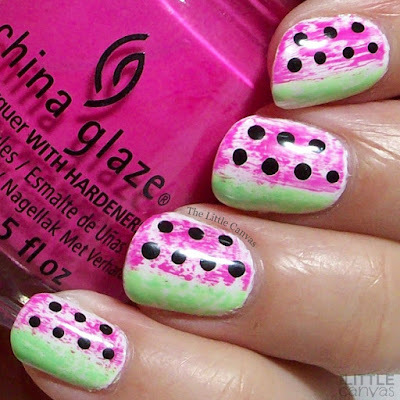 Then go through with a pink polish and dry brush the rest of the nail. When that's all dried, take a black polish and dot your seeds on. Finish with a top coat and bam, done. What do you think? Like these watermelons? Something you'd do?